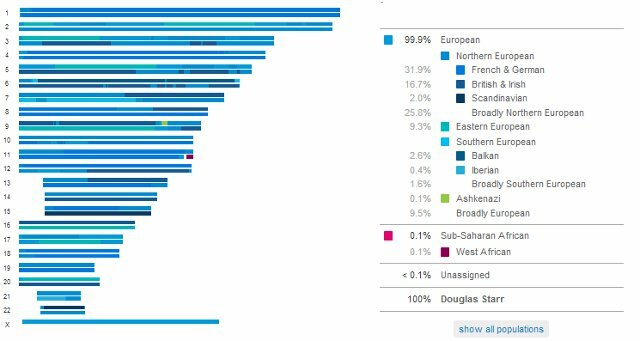 DNA ancestry tests like those offered by 23andMe or ancestry.com are a lot of fun and in some cases can be incredibly useful. For example, if you’re adopted, you can find out things about your past you had no way of finding out before. You can also find long lost relatives or confirm relationships you weren’t sure about. (Click here for a great example of a person confirming that someone he thought was a first cousin really was.) And of course, it is just plain fun to find out your family history. But this isn’t enough for everyone. After finding a seemingly endless supply of fifth cousins, you may now want to get more out of your DNA test. You may want to learn a bit about what your DNA can say about your current and future health and maybe even about your earwax and why your pee smells funny whenever you eat asparagus. If this were 2012 or even most of 2013, you’d have no trouble at all finding out about this stuff. You would have seen all this information and more from a 23andMe test. This all changed in November of 2013 when the Federal Drug Administration (FDA) forced 23andMe to stop giving out these types of results. Now it may seem like that until the FDA and 23andMe work out their differences, there simply isn’t any way to get a hold of the kind of data you used to be able to get. But there actually is with an online resource called Promethease. For just $5, Promethease can turn ancestry/family DNA data from companies like 23andMe, FamilyTreeDNA, and/or ancestry.com into DNA health data. The link here has step-by-step instructions about how to get your raw data from each of these companies and how to use Promethease to learn about your disease risks, which medicines may give you trouble and even which bits of DNA contributed to those blue eyes. Sounds like a perfect way to convert your ancestry data into health data! Except, of course, that you need to be careful about the data you get and what you do about it. Remember, genetic tests in general can only tell you what scientists know about the DNA these tests look at. They obviously can’t tell you anything about the DNA the test doesn’t cover nor things hidden in the DNA that scientists haven’t figured out yet. Your results will be constrained both by what we don’t yet know and by the DNA the companies happen to test. Now none of this says anything about Promethease at all. They do a great job at providing the most up-to-date information based on the literature that is available for various DNA differences that result in increased disease risk, eye color prediction and so on. It is just that the picture you will get will be incomplete. And different based on the test results you use. This may all sound pretty abstract but this stuff matters. To show you how, I’ll use my Alzheimer’s risk as an example. As you’ll see, my original results from 23andMe are different from the Promethease results I get from the same 23andMe data. And the results from my ancestry.com data are different from both of these. My reported lowered risk is almost entirely due to my having two copies of APOE2. I got my 23andMe test before the FDA (temporarily) halted them from giving out health data. As you can see at the right, my risk for Alzheimer’s is, according to the test, much lower than average. This decreased risk is almost completely determined by my having two copies of the APOE2 version of the APOE gene. Now of course there are many other genes that will affect this number either positively or negatively. But APOE is the most important gene scientists have identified so far. When I send my 23andMe data through Promethease, I do not get my results distilled this way. I see a much longer list that includes many findings that 23andMe probably correctly chose not to include because the results are too new, not significant enough, not done with enough participants or any other number of potential problems. This makes the report harder to interpret as I don’t know which results are the most important (although the report does give me some idea). What this means is that I see lots of reports based on different parts of my DNA. A quick look suggests a wash—the different bits of DNA I have that contribute to my Alzheimer’s risk seem to all cancel out. With more digging I would be able to glean the fact that my APOE2 is the key part of my test results and that I have a lowered risk based on the DNA they tested and by what we know about Alzheimer’s and genes right now. But it would take a lot of time and not necessarily be easy (especially if I weren’t already a scientist). 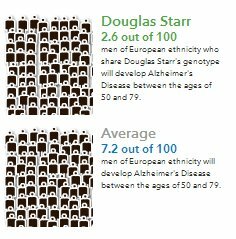 My Alzheimer’s risk is very different when I look at my ancestry.com results because they happen not to include the APOE2 marker. Because of this, I end up looking like I am at a higher risk for Alzheimer’s because of all of those other, less significant markers. If I were just to use my ancestry.com results, I would come to a completely different conclusion about my chances for getting Alzheimer’s.This result would matter a whole lot more if instead of two copies of APOE2, I had two copies of APOE4. Then I would be at a significantly higher risk for Alzheimer’s but this would be invisible to my ancestry.com results. None of this says anything bad about ancestry.com. They presumably chose the DNA they wanted to focus on based on what would give them the best results for ancestry and there is no reason to think they chose poorly. It is just they did not happen to choose the specific bit of DNA that indicated I had a lowered risk for Alzheimer’s. This all points to the bigger problem with trying to predict disease risk for complicated diseases with an incomplete understanding of our genome. Even if we sequenced every last A, T, C, and G, we still might not get an accurate read on our risks for having a heart attack or ending up with diabetes.